We provide everything you need to begin your adventure including English-speaking tour leader and transport. Since your safety is our top priority we also loan helmet and safety gear such as elbow pads and knee pads for use during the tour free of cost. 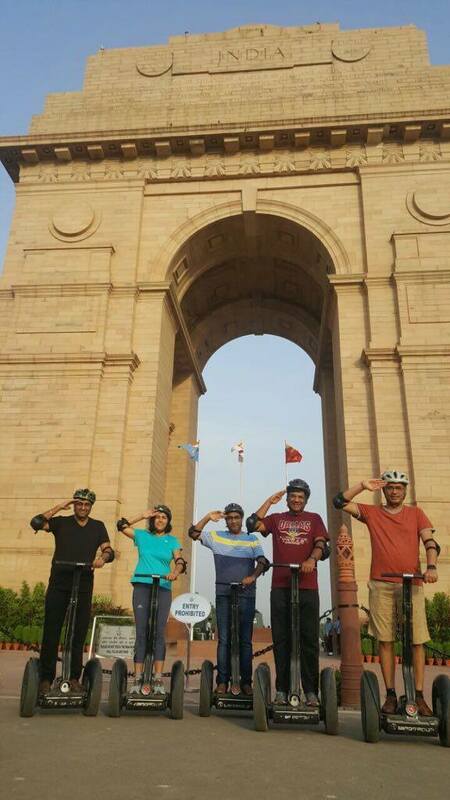 Lutyens' Delhi is an area in New Delhi, India, named after the British architect Edwin Lutyens (1869–1944), who was responsible for much of the architectural design and building when India was part of the British Empire in the 1920s and 1930s. Just a century ago, the British moved the seat of their empire from Kolkata to Delhi. And it has been the Capital of India ever since. Now a thriving, cosmopolitan metro, the city has much to celebrate as it has already reached the milestone of completing 100 years as a Capital. With a history that goes back many centuries, Delhi showcases an ancient culture and a rapidly modernising country. Dotted with monuments there is much to discover here. The seat of many powerful empires in the past, its long history can be traced in its many carefully-preserved monuments, ancient forts and tombs. - Back to the start point at Secretariat where the guided Segway Tour concludes. The Indian capital city of Delhi has a long history, and has been an important political centre of India as the capital of several empires. Much of Delhi's ancient history finds no record and this may be regarded as a lost period of its history. Extensive coverage of Delhi's history begins with the onset of the Delhi Sultanate in the 12th century. 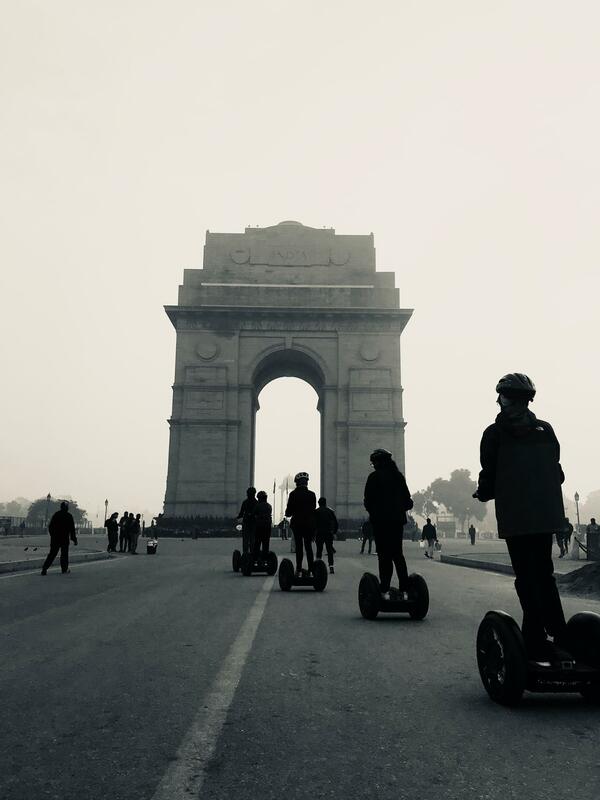 Since then, Delhi has been the centre of a succession of mighty empires and powerful kingdoms, making Delhi one of the longest serving Capitals and one of the oldest inhabited cities in the world. It is time to celebrate this city which is a symbol of the country’s rich past and thriving present. So come and look out of the window and discover a few key places of a historic city with numerous stories and experiences. Q1. Do I have to purchase a tour voucher in advance? Advance purchase is strongly recommended, as tours size is limited and often sells out quickly. Q2. Do I have to bring any ID Proof? As tour itinerary covers security sensitive locations also, it is mandatory to produce a government issued Photo ID proof at the time of arrival. Q3. I have children in my group that are under 10 years old. Can they still come on the tour? No, unfortunately children under the age of 12 are not permitted on the tour for safety reasons. Q4. Where does the tour start and end? Tour starts at the parking on Vijay Path opposite South Block of Secretariat. Q5. What exact locations do we visit? There are two packages available with different itineraries. Pleas refer to our website for details. Details of which are mentioned in our website. Q6. Are the tours conducted in English only? Primary language is English however tour guides on request address guests in Hindi as well. Q7. How will I hear the tour guide's commentary? Our tour supervisor and marshals will be interacting with you all along the tour whilst they ensure your safety and security. They will keep informing you about all the monuments and important buildings falling in your itinerary. Q8. What happens if it rains? Tours run rain or shine. But don't worry! Some of our best tours have taken place in less-than-perfect weather! Just remember to bring a poncho, not an umbrella, as you will need both hands to operate the Segway. Q9. Do I have to sign a waiver? All tourists must sign a liability waiver before taking the tour. Tourists under the age of 18 must have a parent or guardian sign for them. Q10. 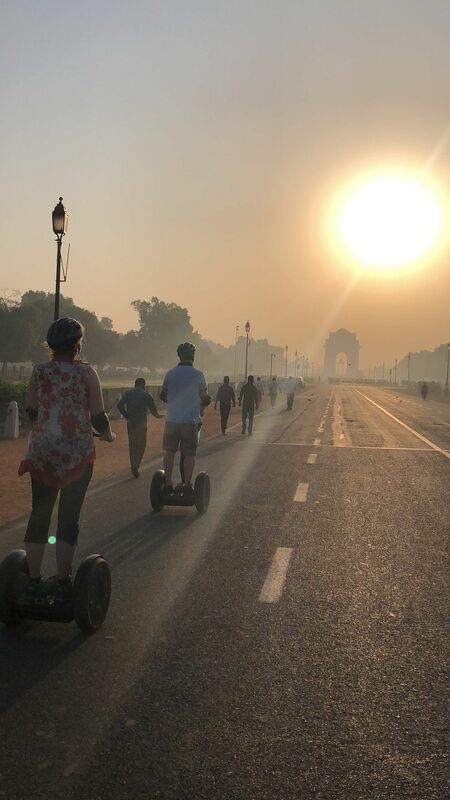 I am a Delhi area local - will I enjoy this tour? 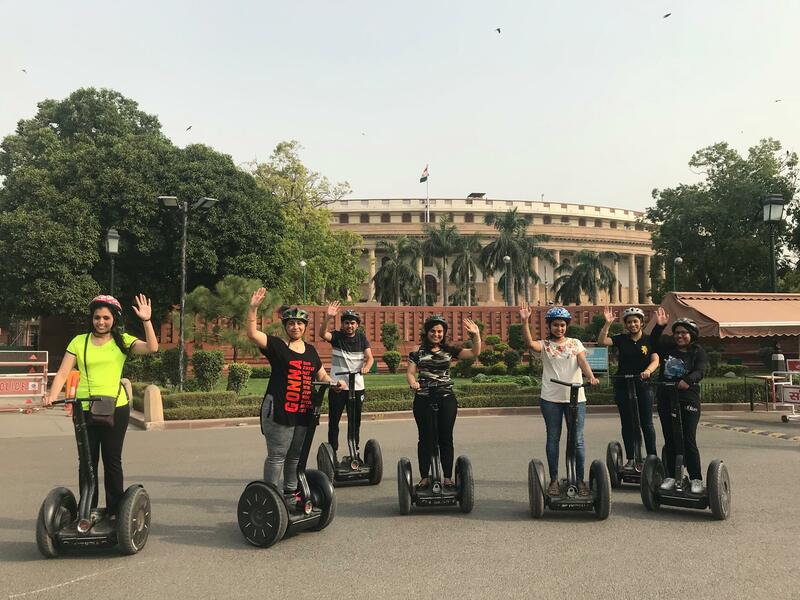 Though you may have seen the sights before, you will still enjoy the unique experience of gliding through the heart of Nation's Capital and seeing it all from a different perspective. Q11. What all items can I bring along on the tour? You can bring a bottle of water or juice and a phone or a camera. Since there is no storage facility company will not be liable for any loss of any item or valuables. At the end of the tour you may ask our tour leader and they will be glad to direct you to the nearest location from where souvenirs can be purchased. Q13. Will we stop to take photos and go inside the sites listed for the tour? Since the tour is of short duration only limited stops at select locations will be made where you can take photos from outside. Q14. 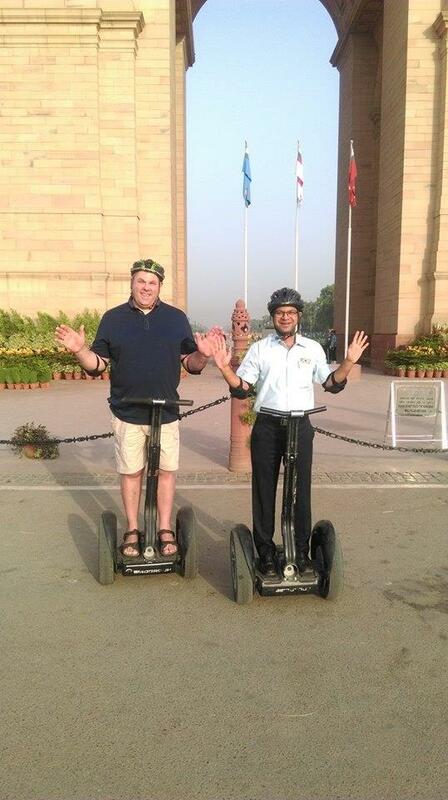 Who can take the tour on Segway ® PT? 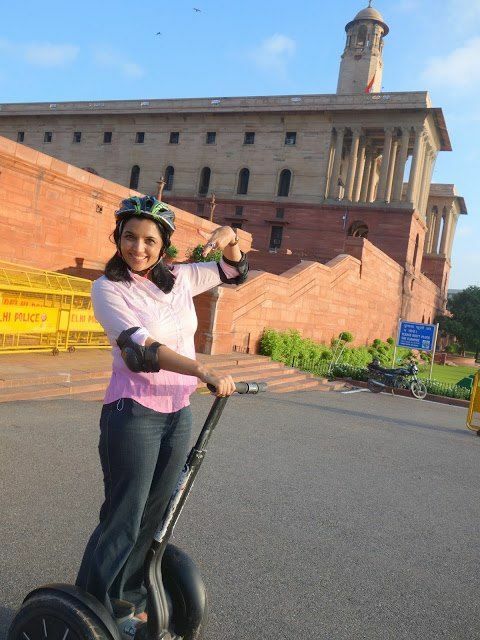 The Segway PT is appropriate for those weighing more than 30 Kg and not exceeding 100 Kg. All tourists should have the ability to make motions such as climbing and descending stairs without assistance. Q15. 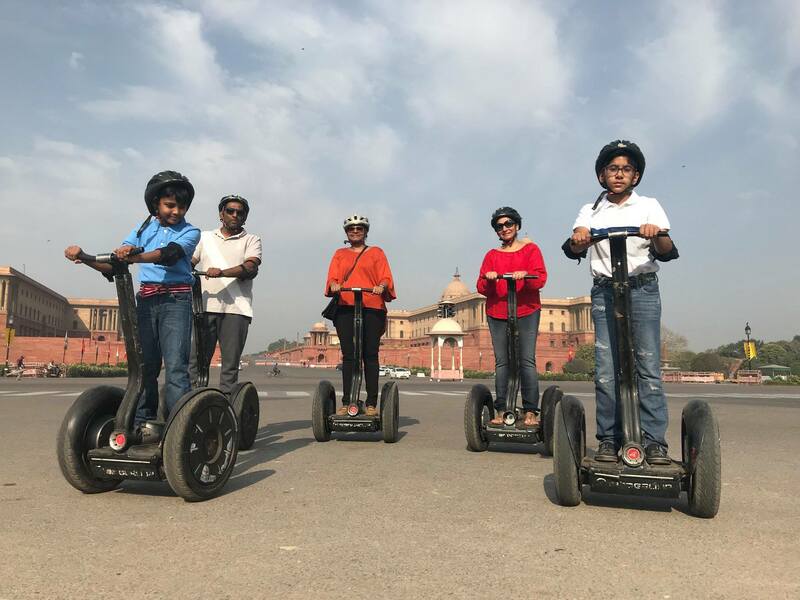 Is there any prior experience or prerequisites to take a tour on Segway PT? 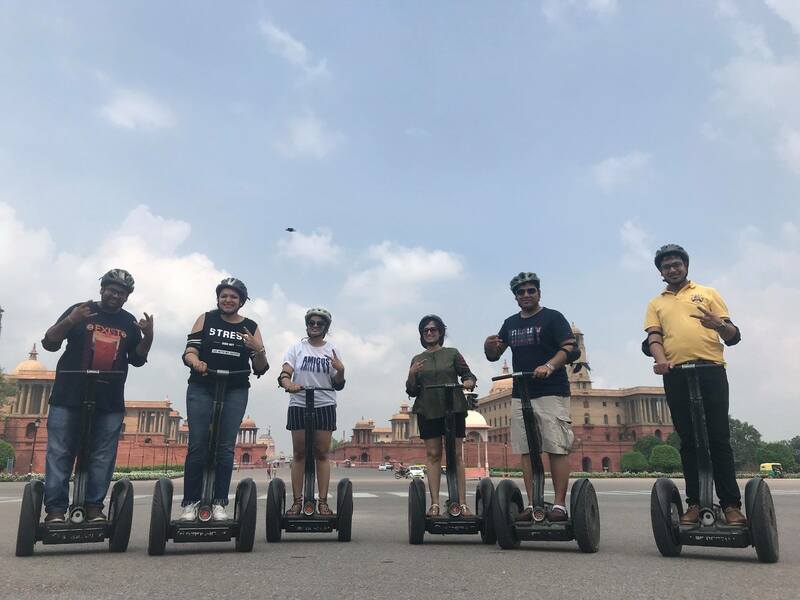 At the beginning of the tour our marshals will provide you a 5-10 minutes of hands on orientation session explaining you all the necessary safety and operation guidelines to familiarize you on how to drive a Segway safely. In addition you will have to wear the safety gears like helmet, elbow pads and knee pad which we shall loan you for use during the tour. You must arrive at the start point with prior booking at least 20 minutes before your tour start time. Valid government issued photo ID must be presented on arrival as we tour covers a few security sensitive locations. The tour will start at the scheduled time and will not wait for anyone who has not reached the venue 20 minutes prior. Tour Voucher once issued are non-refundable. Stopover of 3 minutes will be given for photography only at select locations due to security. You must at all times remain with the group for your own safety and security and strictly adhere to the security. instructions. You will be personally liable for any mishap due to non-compliance of security instructions. All safety gears and Segway must be handed over to the tour leader at the end of the tour. Bird Hospitality Services (BHS) would not be liable for any cancellation of tour which may occur due to reasons beyond its control, inappropriate weather conditions, any VIP movement, any form of security threat or any other natural calamity etc. in which case the tour will be rescheduled for any other day within the next 30 days.